The Tenkara Jam last month was loaded with good information and hands-on opportunities. One of the better presentations was by Rob Worthing of Tenkara Guides LLC. Rob’s presentation was a detailed exploration of handling big fish and is now a guest post on Casting Around. If you are interested learning a field tested way of handling big fish you will be hard pressed to find a better resource. This then becomes a great way to help tenkara anglers look at the spectrum of fixed line rods that are now available. For quick reference here in the Valley, I would equate these subdivisions to the following local waters; headwater = Rapidan or Skidmore Fork, mountain = Dry River or Mossy Creek and mainstream = South Fork of the Shenandoah. Mossy Creek Fly Fishing. has rods that work in all these subdivisions and I plan to adopt Rob’s explanation as a way to help my clients and customers understand what rod to use where. In my review of Tenkara USA’s new triple zoom rods the Rhodo and Sato, I included links to a couple of reviews. As folks get their hands one these rods more reviews are popping up. In order to have reviews handy they are listed and linked below. I will add more as I find them. Teton Tenkara: New Tenkara USA rods: Sato and Rhodo — review and Tenkara USA Rhodo — review on You Tube. If you have a review you would like included, let me know in the comments and I’ll post it here. You can get the Rhodo and Sato in the store or online from Mossy Creek Fly Fishing and there is no charge for shipping! Guiding for Mossy Creek Fly Fishing is one of the more enjoyable and interesting parts of my crazy life. But what adds to the enjoyment is the community that is part of Mossy Creek Fly Fishing. The owners are guides themselves and they bring the positive guide attitude to the shop and those of us who work with them. It is hard to explain to friends and clients how just much fun it is to work with the Trow Brothers but Two Fisted Heart Productions has done a great job in this trailer for Blood Knot, their entry in the 2014 Fly Fishing Film Tour. Tenkara USA recently brought out two new rods, the Sato and the Rhodo, earlier this month. I picked up one of each this week at Mossy Creek Fly Fishing and celebrated a 60+ degree winter solstice giving them a work out on one of our local spring creeks. You can get the Rhodo and Sato in the store or online from Mossy Creek Fly Fishing and they don’t charge for shipping! While it was warm, it was also breezy, giving me a chance to see how these new rods handled in the wind, a common tenkara nemesis. 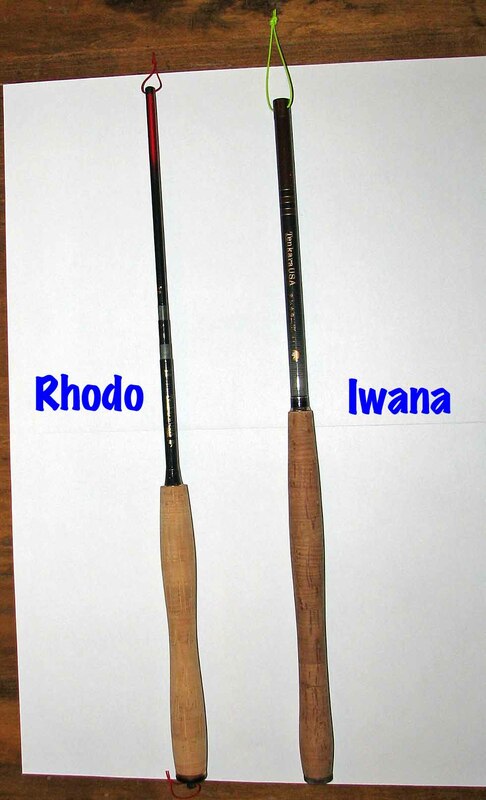 I took along my two current favorite Tenkara USA rods, the Iwana and the Ito so I could compare the new against the tried and true. I am not a level line guy (Tenkara Talk has excellent level line review here). I like lines that let me feel the rod load and level lines don’t do that for me. I fish the tapered tenkara lines and some lightweight, narrow gauge, fly lines that we have been using at Mossy Creek Fly Fishing for a year or so. The lengths are noted in each rod review. There is a logical, scientific explanation for this I’m sure having to do with weight, balance point and centers of gravity, but I never paid much attention to that stuff in school so I’ll leave that to others (Teton Tenkara does a great job here). What I did notice was that it didn’t change appreciably at the different lengths. From the start, defining action with tenkara rods has been a challenge and there are a variety of measures used these days. So far nothing has emerged as the standard and TUSA has avoided labeling the actions of these rods. 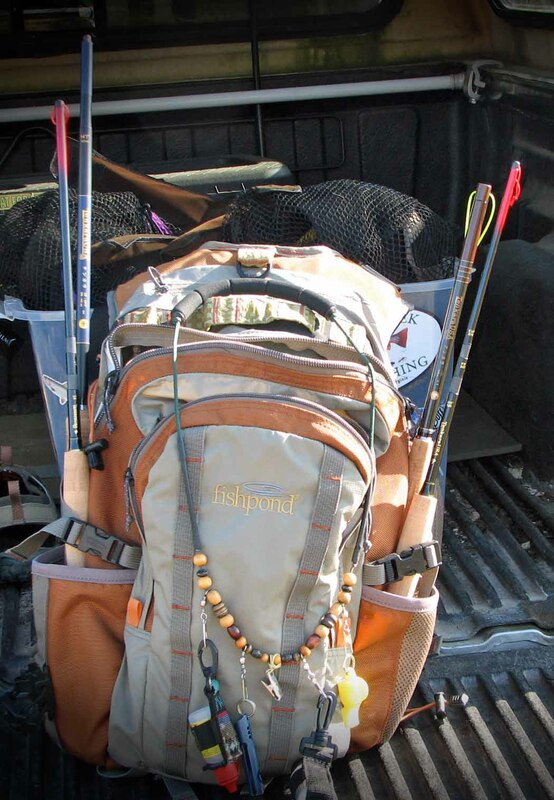 ACTION: We’re phasing out the Tenkara rod index system. We have decided that we will make the best tenkara rods around and the flex of a tenkara rod is not a crucial aspect of selecting a tenkara rod. 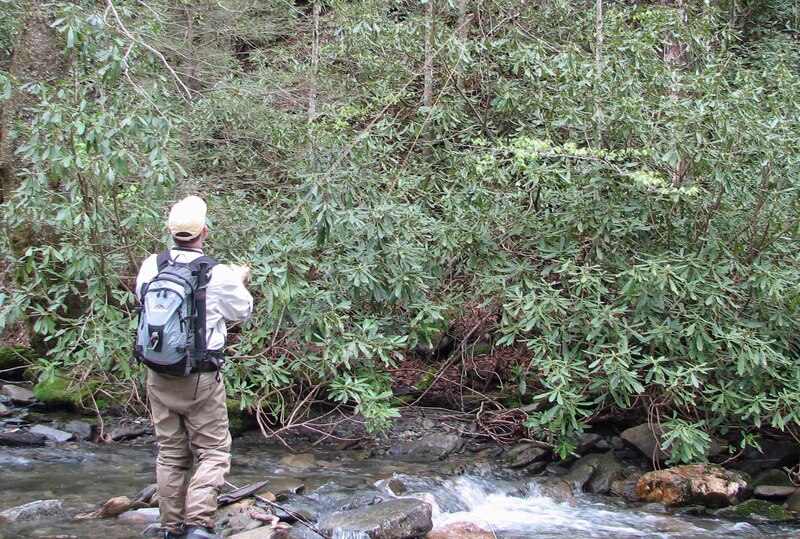 If you have been tenkara fishing for sometime and want a frame of reference, the Rhodo is a fast 6:4. 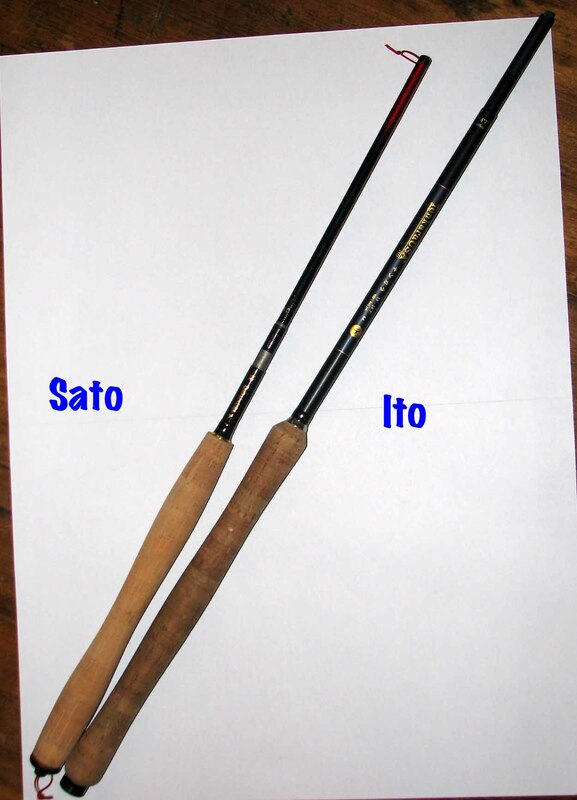 The Sato, like the Rhodo, is a “triple zoom” rod letting you fish it at three different lengths,10’ 8”, 11’ 10” and 12’ 9”. While not as long as the Ito, it has a much more agreeable casting feel. Like the Rhodo the Sato is light in the hand at all lengths, a noticeable difference from the Ito that feels softer and tip heavy when fully extended. I’m not dogging the Ito, the extra length can be important. The Sato’s more refined feel is much more to my liking. The Sato’s profile is significantly smaller then the Ito and this was advantage in the wind. The Sato weighs in at 2.6oz compared to the Ito’s 4.1oz or the Amago’s 3.5oz. Sato/Ito pix In the summer, the beetles, crickets and hoppers make for some of the best dry fly fishing around. Big fish eating big flies. Unfortunately level and furled lines have trouble turning over big terrestrials. To start I fished a little bit bigger fly than I did with the Rhodo, running a size 12 parachute Adams and then adding a size 14 bead head pheasant tail. The Sato fished this combo with ease. Like with the Rhodo, the ability increase and decrease rod length was a terrific advantage. In order to see how the Sato handled big flies I put on one of our 14’ flylines with a size 8 PMX. This would be a typical rig for summer. Fished at all three lengths the Sato turned it over easily and accurately. I added a size 10 CK nymph as a dropper and the Sato handled it just fine. Upping the ante with a 17’ line the Sato still put the fly on target and with a much crisper feel than the Ito. They will be what I reach for first in the coming year! Remember the Rhodo and Sato available in the store or online at Mossy Creek Fly Fishing and there is no charge for shipping! Rhodo and Sato now have a place of honor.